When times are tough, even the people printing fake euros won’t keep up the liquidity supply. THE EUROPEAN CENTRAL BANK has reported another fall in the number of counterfeit banknotes – bringing the number of fakes to its lowest in nine years. The Frankfurt-based bank said this afternoon that a total of 251,000 fake notes were withdrawn from circulation worldwide in the first half of 2012. The latest figure is the lowest since the first half of 2003, when the currency was in its infancy – and down by almost 44 per cent on their peak from the second half of 2009, when 447,000 counterfeit notes were identified. €20 notes were the ones most likely to fall victim to counterfeiting, accounting for 42.5 per cent of the notes seized in the first half of the year, while €50 notes made up another 34.5 per cent. Only 0.5 per cent of the counterfeit notes were passing off as the highest-value €500 note. €5 notes, the least valuable, made up a similarly small proportion of those seized. By comparison, some 296,000 fake notes had been seized in the first half of 2011, a figure which rose to 310,000 in the second half of the year. The ECB said the overall proportion of counterfeits was quite low, when compared to the 14.6 billion genuine banknotes in circulation in the first six months of this year, but warned the public to remain vigilant for fake banknotes. The most recent Irish statistics showed a decrease in the number of occasions in which counterfeit banknotes were seized by Gardaí, with 375 collections last year in comparison to 552 in 2010. Only 21,965 fake banknotes were recovered in the first half of 2002, after the currency was introduced as legal tender in 12 European countries, but that number had risen to over 300,000 by the second half of 2003. The ECB said 97.5 per cent of the fake banknotes were seized in Euro-area countries, with another 2.0 per cent seized in other EU countries and the remaining 0.5 per cent seized in territories outside the EU altogether. How can you tell a note is genuine? 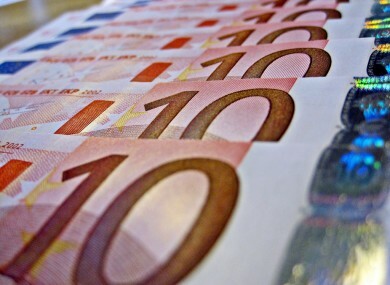 The euro note is designed to be one of the most difficult currencies to forge, and has a number of notable features which aim to discourage counterfeiting. Security thread – Holding notes up to the light, you should see a ‘thread’ interwoven into the note, down the middle of the note. Microprinting – Take out a €5 note and look at the bar on which the word EΥΡΩ appears. That grey text? That’s actually the words ‘EΥΡΩ’ and ‘EURO’ written in very small letters. Bar code – Hold a note up to the light. You’ll see a barcode to the right of the watermark. The width of the codes on this indicates the note. Checksum – The serial number of each note is preceded by a letter. If you convert this letter to its ASCII equivalent and add all the digits together, the number will be divisible by 9. Email “Even the amount of counterfeit euro notes is falling”. Feedback on “Even the amount of counterfeit euro notes is falling”.